Help Kaja to win her life! Kaja żyje dzisiaj dzięki Wam... i nadal o to życie walczy! 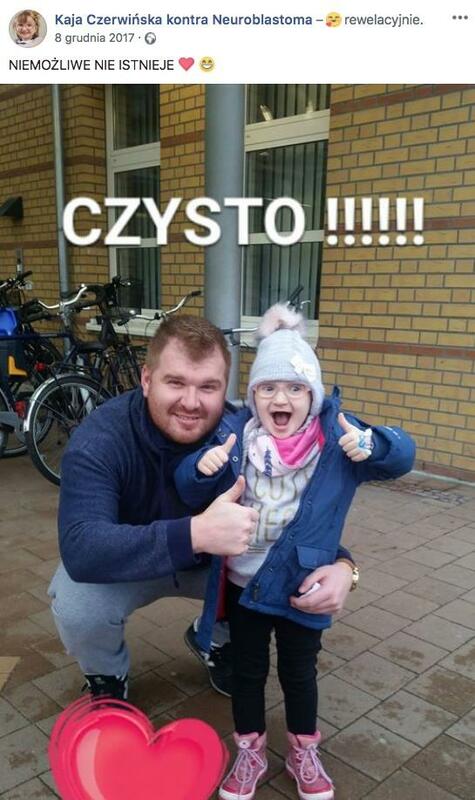 Niestety śmiertelny przeciwnik, neuroblastoma, nie odpuszcza… Wydawało nam się, że Kaja wyszła z tej walki zwycięsko, ale rak powrócił. Dzięki Waszemu niesamowitemu wsparciu w krótkim czasie udało się zebrać całą kwotę, potrzebną na leczenie Kai. Dziewczynka przeszła 5 cykli przeciwciał anty-GD2 w klinice w Greifswaldzie. Dobrze zareagowała na leczenie. Ostatni cykl odbył się w sierpniu 2017 roku. Co 3 miesiące Kaja wracała do Niemiec na onkologiczne badania kontrolne, gdzie robiono jej m.in. scyntygrafię, rezonans, punkcję szpiku i wiele innych badań. …a po nim 9 miesięcy normalności. Uśmiechy, wakacyjne szaleństwo, koleżanki, zabawa, zerówka… beztroskie dzieciństwo. Tak, jak powinno być zawsze. Niestety nie na długo. We wrześniu mama Kai wyczuła niepokojące zgrubienie pod kolanem córeczki… Nie tak powinno być. WZNOWA. Rak znów zaatakował! Po wstępnych rozmowach z lekarzami [w Greifswaldzie] wiemy, że podejmą się walki o życie Kai – napisała mama dziewczynki. Wszelkie decyzje o sposobach leczenia i powstrzymaniu rozprzestrzeniania się choroby mają być podjęte w najbliższych dniach. Na ten moment leczenie w Polsce jest bardzo mocno ograniczone, a wręcz praktycznie niemożliwe, gdyż Kaja przeszła wszystkie dostępne protokoły leczenia. Kaja rozpoczęła kolejną odsłonę swojej walki o życie. Wierzymy, że tym razem zakończenie będzie tylko jedno - szczęśliwe. We have been dying three times. The first time, when it turned out that Kaja has cancer. 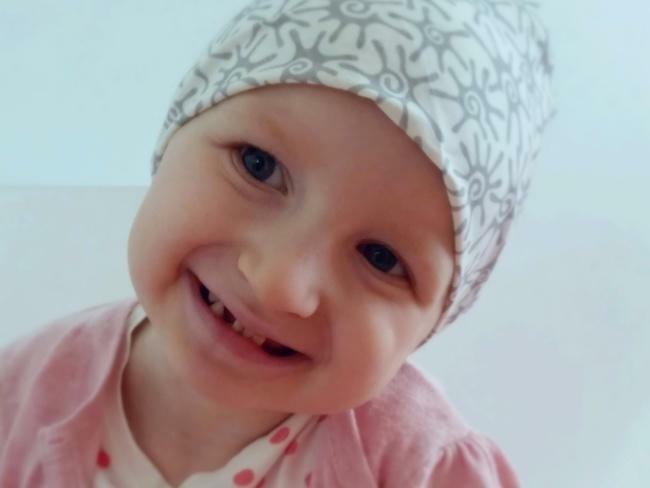 The second, when recurrence was detected in the bone marrow and bones and Kaja was back in the oncology ward, she was terrified, crying in pain. Third time is now when the therapy that worked is blocked by the decision of officials. It may take many months to arrange a formal agreement to the protocol that may change this decision. Our daughter was close to a victory in this brutal struggle for life when the Polish healthcare bureaucracy sentenced her to death! Kaja’s treatment can be continued only in Germany, but we have to pay for it. Now the enemy is not only cancer, but also time and the amount we need to collect till the end of February! Otherwise, the last chance for Kaja may be lost forever. The ultrasound examination lasted a minute. When we saw the doctor's face, her eyes wide open as she looked at the screen ... we started to be more and more frightened. It’s bad, tumor size 8 to 10 centimeters, immediately go to the oncology … Then she did not use the word cancer. We heard it later, when there was no doubt. Neuroblastoma, a malignant tumor of the nervous system. Cancer so cruel that only attacks children, taking the lives of the most innocent - the 50% of patients suffering are not even two years old. In the first and the second stage of the disease there are high chances of cure, but developing neuroblastoma remains long hidden, slowly getting ready for the knockout. When the tumor begins to give symptoms, then it is probably a fourth stage, they are bone metastases, the chance of cure drops to 15%. As in Kaja’s case. The first few weeks in the cancer ward was like a bad dream. When we sat in front of the doctors after each test, we still had a hope that they would tell us it was not cancer, that they were wrong. But hope soon extinguished. The metastases were discovered in the bone marrow and bones. During a biopsy of the tumor Kaja almost lost her life - a tumor pricked by doctors began to leak and caused internal bleeding, Kaja had to be resuscitated. Probably then we understood that our child can really die. Each of us all from time to time sees posters, appeals for help with photographs of children with bald heads, children who may die too early. Then we all feel a crush in the throat, we wonder how their parents cope with the situation. Now we already know the feeling but still cannot find words to describe how it is when you look at your baby in a hospital bed, hooked up to a drip of chemistry, when you hear her screaming in pain and you can't do anything. We cried and Kaja, our brave little girl, shocked us with her strength. She not only survived the treatment and even very aggressive chemistry but the results were so good that physicians were even amazed. She was stronger than us ... hope was back. We returned home. We believed that this is return to a normal life. Kaja’s hair began to grow. Two months later during the examination we heard one word that was like a return ticket to hell. It surprised even the doctors. Recurrence. Cancer in the bone, abdomen, legs. We believed that Kaja from the beginning to the end would be cured in Poland by the National Health Fund. We did not have to beg for help and could focus on her therapy. On the 29th of November 2016 Kaja underwent autograft bone. Then there was a diagnostic test, doctors began to prepare her for immunotherapy. We returned home and waited for the phone from the hospital. We had already packed suitcase when they finally called… Instead of a desired start date of the last stage of treatment, we got information that it would not happen because the treatment in Poland is no longer available. The Protocol was suspended indefinitely! We could not believe that the children who had already started treatment were deprived of continuing. We could not believe that the Polish government would allow to stop treatment because it would mean that the children were poisoned chemistry for months and prepared for immunotherapy in vain! Immunotherapy at the moment is not available in Poland. We know that there will be a request to the Office for Registration of Medicinal Products, and the treatment may be resumed, but with optimistic forecasts, in three to five months... Kaja cannot wait so long. The test MIBG proves there are bad changes and Kaja’s bones shine like a Christmas tree ... There is so much metastases. Each day of delay reduces the chance of a cure for life! We had been so close to win. The only thing that the doctors in Poland offered us is a continuous chemotherapy, but it does not work for Kaja anymore. They promise that the treatment will start, but the question "when?’ does not have any answer. We have no more time to loose because it may be too late to give antibodies. We cannot wait till the cancer is so strong that nothing can be done. We, the parents, what would we tell her? So many years of her suffering, sacrifice in vain? Kaja was never in a kindergarten, the only thing she knows it's a hospital. All her friends have bald heads. With some of them she is not going to play any more as they passed away...The aggressive chemistry destroyed her kidneys, teeth ... Her favourite game is setting up drips for her dolls and teddy bears - everything that she experienced so far. And it's all for nothing? At the end of February it will be time to give vaccine to Kaja. We have two choices - do nothing and stay in Poland and there will be progress, not regress of the disease. Waiting for treatment in our country may last too long and till it will be available the cancer can be so strong that Kaja will be excluded from treatment, it may be too late. And that means death. The second choice is a continuation of treatment in Germany, which involves collecting a huge amount of money - immunotherapy for Kaja costs more than 150 000 Euro! However, it gives a chance to survive. Therefore we beg for help - we do not want anything more than to heal and save our child! Does anyone in our position would have behaved in a different way? !